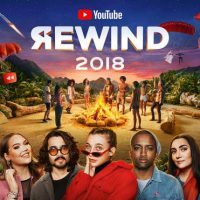 Normally there’s a lot of cool references and memes and stuff in YouTube Rewind, but this year it came out, and not really a lot happened. It’s always really cool to see all your favourite creators coming together and this year was no different, but it felt kind of empty. The premise behind this year was “everyone controls rewind” and it was okay, I suppose. It definitely had it’s moments, like when they pulled out the comments and did a bunch of crazy stuff that the comments were asking, but other than that it felt… Safe, I guess. On a more positive note, I just wanted to list a few of my favourite creators who were in the rewind this year. ASAPscience, JaidenAnimations, James Charles, John Oliver, Lily Singh, Lucas the Spider, Marshmello, Mason Ramsey, Molly Burke, Primitive Technology, Rosana Pansino, Safiya Nygaard, Sam Tsui, Bongo Cat, The Try Guys, TheOdd1sOut, and Trevor Noah, and that’s just the ones who’s videos I’ve shared over the course of the year! Needless to say, if you like any of those creators, you should check out the Rewind. Sure it’s a little lackluster, but it’s still great!